As the sun was rising on April 12th, almost 5000 men and women, most of them dressed in pink tutus, tiaras, and other motivating costumes, were preparing for the Divas Half Marathon and 5K race in North Myrtle Beach. The OD Shag Club dance team was also preparing at 6:30am to showcase the SC State Dance to these runners by “dancing on the streets” as they passed the Half way mark at Second Avenue and Hillside Dr for both races. Lou Martino, Linda Campbell, Barbara Hopper, Jay Kellerman (newest member of the team) and of course, our own Lenny Gardner demonstrated the dance, offered encouragement to the runners and even got to dance with some of the runners. We received a lot of “thumbs up” from runners as they passed indicating their excitement of seeing the Shag dance. We finally got a chance to meet the event planner Katherine Stimson, who relayed to us that she had heard great responses from the runners about seeing the shag performed. We feel it was we, who were encouraged by the dancers as we saw women and men, of all ages (14-74), some with disabilities, some in wheel chairs, some pushing babies in running strollers, all defying the odds to complete the race and achieve their goals. We have already put May 1, 2016 on our dance team calendar for next year’s race and wish the event safe travels as they travel to Galveston, TX. 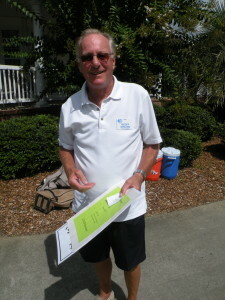 Our 25th Annual SOS/ODSC Charity Golf Tournament was again held at the Valley at Eastport Golf Club in Little River, SC. Seventy-three golfers took part on a beautiful day for golf. Everyone enjoyed meeting and greeting old and new friends. The golfers were from all over the US and a lot of local players also. Golfers started arriving about 7:30 am. They were greeted by the ladies and bags were checked in. Liquid sunshine, biscuits and donuts were available for everyone. After a brief welcome by Geoffrey Girling and Bill Jones, the GM of the golf course, Sonny Tomberlin explained the changes in the rules, the putting contest, the marshmallow long drive contest and shortcut to eagle. The shortcut to eagle gave the golfers an opportunity to play from the 150 yard marker. All winning teams scored under par. 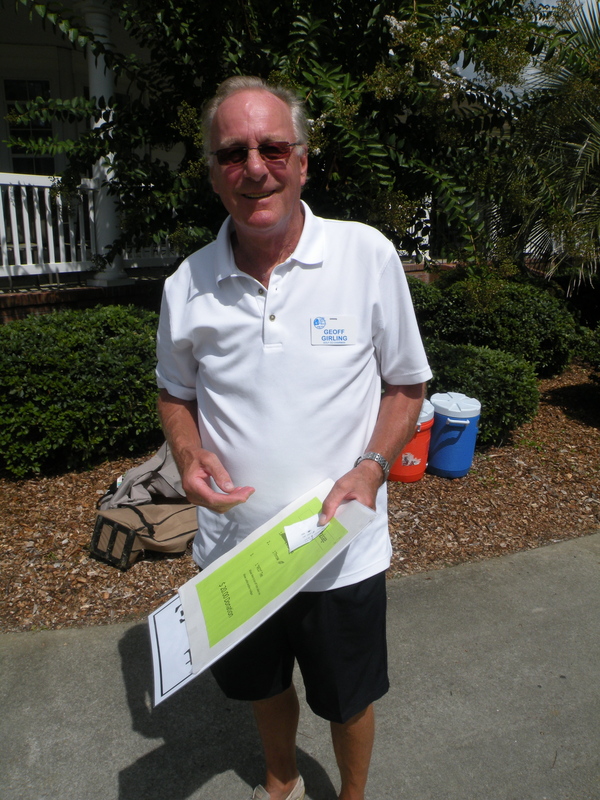 This year’s golf tournament was led by Geoffrey Girling and Sonny Tomberlin. The Raffle Prizes and the hole sponsors was led by Karen and Rich Young. Board Liaison was Brian Schmitt. Administrative assistance was provided by Joyce Girling, Monica Powell and Karen Young. Many ODSC members participated in obtaining hole sponsors and prize donations. Many members also participated on Tournament Day doing various jobs from picking up food, registering golfers, checking bags, selling mulligans and raffle tickets, cooking hamburgers and hot dogs to being cart girls. All volunteers added to the success of the tournament. Our Club is fortunate to have each of these caring and participating volunteers. As always, special thanks to each of them for their dedication and participation. The names of our Sponsors are listed below. Please show your appreciation by patronizing their business. The following business and individuals have graciously contributed prizes and gift certificates to the OD Shag Club’s Charity Golf Tournament in 2015. Please express your appreciation by supporting their business. Do you know our Ways & Means Chairperson….Beth Cornwell? After coming to NMB all her life Beth, and her husband Joe, bought a house here in Ocean Drive in 2010. They both retired in 2012 and moved here permanently that same year from Huntersville, NC. Beth said she loves living at the beach where she is only a short golf cart drive to the beach where her family and friends can come to visit. And speaking of family; Beth is the mother of three children and grandmother or “Baaba” to six wonderful grandchildren. Prior to retirement Beth spent 36 years in the education field as both a teacher and an assistant principal. Being married to a retired teacher myself, my guess would be that was 36 long years! Beth and Joe joined the club in January of 2013 and just jumped right in. They attend the monthly parties and volunteer wherever needed. Beth said her favorite ODSC events are the Poker Run and the SOS Parade. She likes the comradery and creativeness she has seen while participating in these events and loves being a part of the creative process. Beth has volunteered to help sell logo merchandise during SOS ever since joining the club and did such a great job she was asked to chair the committee this year! She is doing a fine job too!! One of Beth’s favorite beach music songs is What You Do To Me, by the Embers. When asked what her favorite memory or ODSC story was she said it was this moment….being honored as a Worker Bee! Beth said she loves working with the club and all the hard working individuals. I say, Way To Go Beth! And by the way can I get that shirt in a different color, different size and different sleeve??? OD Shag Club made a grand appearance at Graham’s Golf Cars on April 4th to sell our Golf Cart Tickets. Our golf cart was front and center!! Terry and Kathy McCoy were able to sell 60 tickets. Graham’s offered live music being played by Ray Scott with yourbeachmusic.com, TV 33 was there filming, Dan Summit with OD Mafia took pictures and Steve Craig sang a couple of songs. Snack food and chicken bog was provided by OD Locals and Specialized Concrete. This was great opportunity for the club to shine in the community and a big thank you to everyone who participated. The Dance Team came out to give a demonstration while Fritz Eckhart took the club pictures. We had members show up to hang out and enjoy the music. There were people dancing and singing in the street in front of Graham’s. It turned out to be a good day for the ODSC. On Monday, March 30th the OD Shag Club held its’ second Easter visit at the Myrtle Beach Manor. I can only speak for myself when I say it was one of the most rewarding evenings I have ever had. The residents who numbered about 45 participated in the evenings’ entertainment: they clapped to the beat of the music, they sang and danced but most importantly they smiled and for a few hours were somewhere back in time. Linda Campbell, Lou Martino, Nancy Snook, John Barringer, Barbara Hopper, Joe Ferlauto and two of our newest members Sheila and Bill Blazer provided the dance entertainment. New members Jim Livingston (Easter Bunny) and Rich Jamiolkowski (Elvis) did an outstanding performance in there respective roles and were enjoyed by all. Paul Craver delighted the audience with two songs before introducing his lovely wife Gail, who performed one of her famous commercials for The Craver Tile Company. Lenny Gardner told some jokes. The ladies of the club then paraded around the floor in their Easter Bonnets’. We then had a sing along with the residents and we closed with the song “God Bless America”. I would like to thank all the members who came out and participated in this special evening, you certainly put a smile on everyone’s face. I would also like to thank Linda Campbell for being such a great MC, Debbie Schmitt for baking the bunny cakes and to all the members of the OD Shag club who attended. You are the greatest! A personal note: This was my fifth event as Chair of the Myrtle Beach Manor and I can only say that in my opinion this was the best of them all. I have never seen the smiles, by both residents and members in attendance, as I did this evening. We certainly are blessed and as in that old saying “it is better to give than to receive” was never more evident. In closing I would like to thank the board for allowing me to chair these events. Until Christmas, this is Joe Ferlauto, your Myrtle Beach Manor Chair saying thank you and may each and every one of you have Blessed Easter and a safe and healthy summer.